I can’t wait to be a "sampler" and I won some Sonny Joe’s! Today has been a go-go-go type of day! I have to say my day was completely brightened when I came home and saw a GIGANTIC box from FoodShouldTasteGood waiting for me! This might just be one of the FUNNEST (yes, it’s a word!) taste tests yet. 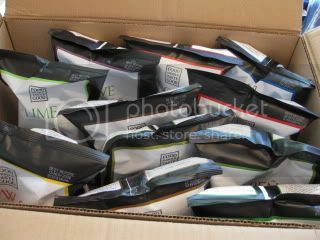 The incredibly nice people at FoodShouldTasteGood sent me a box full of FULL SIZED bags in EVERY flavor to take to my next Weight Watcher meeting. Our meeting gets to do a taste test sampling! Woohoooo!!! How cool is that?! I will probably wait until my NEXT meeting so I can finish the Bikini Bootcamp challenge and get all the supplies needed for taste testing. But, I promise to tell you all about it with feedback and pictures and reviews galore. In the meantime, check this out. You call can earn your very own FREE case by entering their recipe contest! A new winner is picked each month. Click HERE for details. To help you get started, click HERE to join their fan club and get a $1 off coupon towards your next purchase. Tonight I took the easy way out for dinner! I was so exhausted after my super busy that the concept of cooking just didn’t appeal. Normally I am against take out because I can always cook faster, but, tonight it was 100% worth it to not have to deal with it. 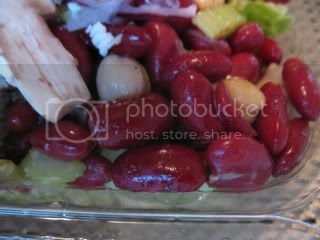 The Bikini Bootcamp Dinner tonight was one of my FAVORITE “spa” salads on the program. Click HERE to check it out. I tried to keep this in mind when we ordered from Mary’s Pizza Shack. Lucky for me I did have part of my dinner made up. 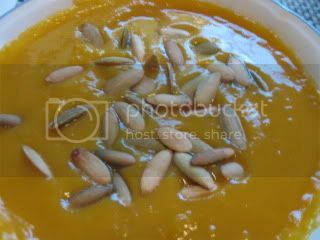 I had prepared the Butternut Squash Soup with Caramelized onions on Sunday. I served it up with a sprinkle of roasted pumpkin seeds. This soup was absolutely fantastic and I am so glad I froze some for later! Leave a comment if you want me to post the recipe and I will. Next up was the takeout salad that I ordered. I ordered up a grilled chicken salad with italian dressing on the side. This salad was HUGE! 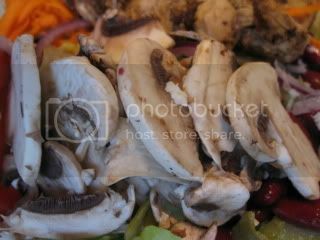 Check out all the great stuff that comes on their salads. I thought ahead too and saved 1/2 my chicken for tomorrow’s lunch – yahoo! This salad was fantastic but I didn’t even come close to eating 1/2 *sigh* It was nice to have the night off from cooking so I could get caught up on things. * I won another Giveaway!!! I finally scored some Sonny Joe’s Hummus by winning Ashley’s Giveaway – yahoo! I have been wanting to try their hummus ever since I heard Sarah say it tastes better than Sabra – is that possible?! I’ll be sure to let you all know. * Have you all ever checked out Fit Bottomed Girls? I LOVE their site. They are hosting a pretty cool little giveaway if you are a fan of Dole Fruit Gels. You can score a WHOLE YEAR supply. Click HERE for details. Ok ~ I think I am officially all typed out! I think that will keep you all busy for awhile. I will catch up with all your comments tomorrow. Tomorrow is going to be just as busy but I am hoping to be able to stop by and send some daily adventures your way. « The new Fridge is in….Show n Tell! Woah – I am soooo jealous of those yummy FSTG snacks! Wow, that's such an awesome package! 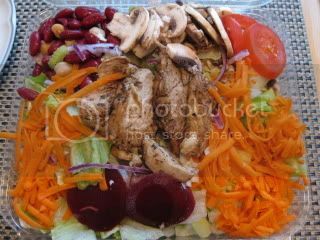 How exciting 😀 That takeout salad looks delicious. I love all the toppings! Congrats on your winnings and opportunity to be a taste-tester. 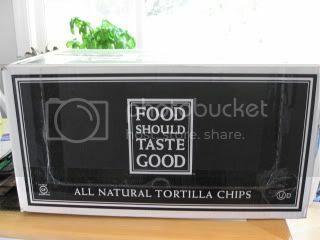 Let us know your perspective on those tortilla chips. 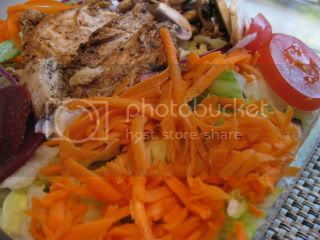 Salad and soup look so delish! those chips sound so good! I've been seeing them on blogs everywhere, but not in stores. How fun! Hooray for a very healthy take out choice! 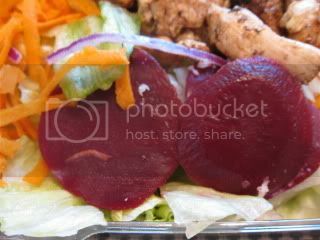 That salad is beautiful! I'm looking forward to tonight's dinner, aren't you? That's so cool you get to sample their product! How do you get to do that? I can't wait to hear your reviews of those chips! I've heard a lot of mixed opinions. Congrats on the hummus!! That would be a dream come true! Wow look at all those chips! I've only tried the olive flavor. I hope you like them! 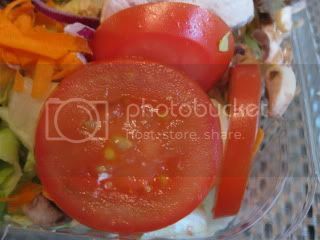 Anne ~ I LOVE salad toppings – it makes it so fun to eat. Plain lettuce just isn't fun to me LOL. Brandi ~ do any of your grocery stores have a naturlal foods section? That is where I saw some the other day (for the first time) at my local store. They are not with the regular fatty chips but in the health food section. Angelea ~ I was trying since it was the first time I ate out doing BBC. Yes, so excited for dinner! It's not fish – yeah! RunToFinish ~ your comment made me laugh – it was a fun day! K ~ I am so excited over the hummus…..I cannot wait to try it out.